You can compare up to 4 domains in the Toolbox. This quick tutorial will show you just how this works. The comparison is based on all the important key figures you can find in the Toolbox. What you will see is restricted to the modules you have activated in your account, at the time. Enter up to four domains into the search field. Divide these with a comma, but without using spaces. This will open up a table directly comparing all domains. 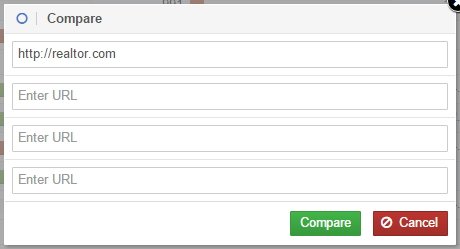 If you are on the domain overview page and have already entered a domain into the search field, you can also use the “Compare with competitors” link inside the “Domain Overview” box. After entering in all domains, the final comparison looks like this. As you can see, you will get a nice overview over important key figures for the domain. In the next part I want to take you through the different parts of the comparison and explain what exactly you are seeing. If you look at the fundamental data like Visibility, PageRank and the number of keywords, the third domain dominates in its home country, as compared to the three competitors from the USA. Another important point is the number of TOP-rankings. The third domain has more rankings on the first results page (Top 10) on Google than the competition. Social Signals show how actively a page shares information over Twitter, Facebook, Google+, LinkedIn and Pinterest. While a high activity does not necessarily mean that you have a lot of “followers” in the respective social network – if this is the case, though, you can precisely share your messages across the web. This evaluation makes it clear that the site operators go in different directions and, respectively, prefer different social networks. There is no domain that has the most social signals across all of the networks. Do your competitors use Google AdWords and if they do, how active are they? Comparing the four domains will give you a short overview of that. It is easy to make out the first domain’s strength when it comes to Google AdWords. It has rankings for the most search terms and ranks most often above the organic search results. Having an average position of three across all Ads hints to the Ads being both well optimised and having a large budget per Ad. In the first line, you will see the number of rankings across all integrations. Additionally, you will immediately see how a domain ranks within Google Shopping, News, Blogs, Pictures, Videos or Maps. 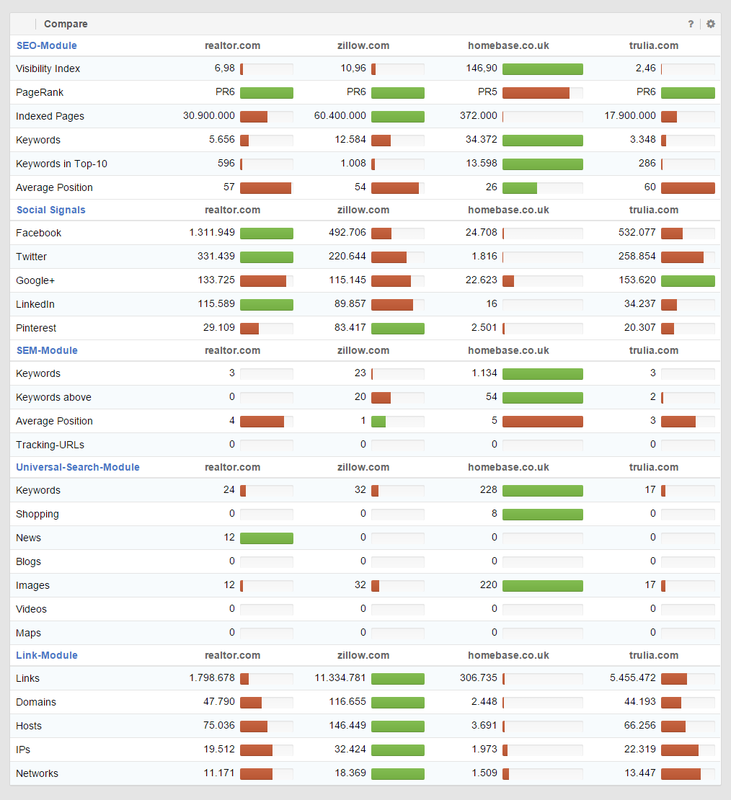 In this case, all analysed pages show rather few rankings through the Universal-Search integrations. If you work a lot with videos yourself, you should get to know the SISTRIX Video Rich Snippet Generator. With this tool, you can integrate videos using the Schema.org markup. In this final comparison, you will be shown data from the link module. Here you can again see the impressive dominance of domain 1. Whether you look at the total number of links, or the domain popularity, the first domain leads in all areas. The first domain ist the clear winner of the entire comparison. While it does not have the most Top 10 rankings, it leads in all other important areas. This quick comparison is not made out to go into detail. You are able to access individual values in seconds, though, which allows you to make rough estimates. Afterwards, you can always decide on evaluating every domain separately, using the SISTRIX Toolbox. Of course you can also compare other website levels with each other. If you enter the protocol (http:// or https://) as well as the rest of the domain into the search field, shortly thereafter the “Compare with other URLs” option will show up right below the searchbar. Once you click on this option, a dialogue screen opens up, where you are able to type in URLs and directories to be compared.